Seventy Years: The Death March and the Defining Moment. Adolf Hitler issues the Nero-Befehl (Nero Order), a scorched-earth directive intended to leave only a ruined Germany for advancing troops. 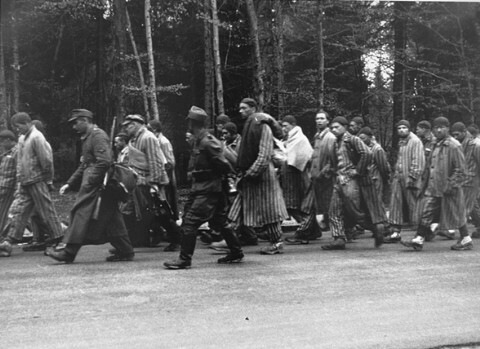 Two hundred survivors out of 1000 Jewish women who began a forced march from the Neusalz, Poland, slave-labor camp on January 26 are evacuated by train to the concentration camp at Bergen-Belsen, Germany; see this post. My mother was one of the 200 or so that survived that “death march”! The survivors were transported to the camp at Bergen-Belsen, where my mother was ultimately liberated on April 15, 1945. Many years ago, she did relate to me a wartime story of hers which I wrote up in 2006, and had published. It happened more than sixty years ago- and not to me- but I cannot dislodge it from my mind’s eye. My consciousness will not surrender the thought of what it must have been like for my mother, especially on one ominous day. I am a child of Holocaust survivors. My parents, and thousands like the, each have personal stories of their incarceration in the various concentration camps that dotted Germany, Poland and neighboring countries during World War II. My parents rarely shared with me their accounts of that desperate period of their lives. When prodded, they might offer an occasional vignette. Seeing the pain on their faces in talking of these experiences, however, I didn’t push for details. Those are memories they certainly preferred to have long forgotten. Of the stories that were begrudgingly told to me, one shared by my mother will haunt me forever. The soul-searching decision with which she was confronted on that fateful day so long ago is unfathomable to me. As a result of the decision she made that say, I am here to tell the tale. My mother spent the flower of her youth- ages 17 through 20- within the confines of a concentration camp in Neusalz, Poland. It was a women’s “slave-labor” camp where yarn was processed for the war effort. Although it was not one of the infamous “death” camps such as Auschwitz, Treblinka or Sobibor, the distinction between these titles is hardly significant. In a death camp the aim was to kill as many and as quickly humanly possible. In a slave-labor camp the goal was, in effect, to work the laborers to death, with an ever-replenishing supply of labor. The death tolls in each were mind-boggling. The human skeletons who managed to survive all looked the same and had similar stories of deprivation, torture, depravity and the wanton taking of life. In the midst of this living hell, an opportunity presented itself to my mother. She saw a possible means of escape. Despite knowing that if she got caught she would face certain death, she took the chance. She escaped, although she never explained exactly how. Clad only in rags, she trudged through unfamiliar territory until she came to a house. She knocked on the door. She related her circumstance to the master of the house and pleaded for food and a place to hide. Although sympathetic to her plight, he told her he could not jeopardize his family. If found to have secreted a Jew, especially one who escaped from a nearby camp, he and his whole family would most likely be killed as a lesson to the community. Yet, seeing my mother’s emaciated condition and dire need- and against his better judgment- he took pity on her. He invited her into his home, let her eat, bathe and sleep the night. Before the break of dawn, however, he said she must be gone. She thanked him and availed herself on his family’s kindness. For one night during a span of three years she had a full stomach, clean clothes and a restful night’s sleep. She left before dawn, as promised. But where would she go? Only then did the truly desperate nature of her circumstance become apparent. For one such as she there was nowhere to go. My mother was confronted with an unimaginable predicament, a sort of Gordian knot. Should she hazard freedom in an unfamiliar countryside filled with antisemitism where peril and betrayal would be her constant companions? Or should she attempt the inconceivable- a stealth re-entry into the camp from which she had just risked her life to escape- hoping the guards had not noticed her absence? As least there she reasoned, she had the known quantity of a controlled environment offering minimal subsistence, albeit in a horrific setting and under subhuman conditions. She chose the latter. In her mind, that choice offered the best chance for survival. As remarkable as was her original escape, doubly remarkable was her ability to re-enter the camp, unnoticed, and return to her quarters before the morning roll call. With the memory of nearly one full day of freedom, my mother persevered. Then, in January 1945, together with 1,000 other interned women, she was set on a one-and-a-half-month forced to march to the concentration camp at Flossenburg, Germany, some 200 miles to the southwest. This was one of many so-called “death marches” that occurred toward the end of the war, in a calculated maneuver by the Nazis to deceive the Allies about the vast network of fully functioning concentration camps in operation during the war years. Along the way to Flossenburg, 800 women were beaten, shot or left to die when they collapsed in the harsh winter. Upon their arrival, the remaining 200 women were transported to the concentration camp in Bergen-Belsen. On April 15, 1945, the British and the Canadians liberated the scant number of those remaining. One of those was my mother. One year later, after surviving family members were reunited, she married my father. I cannot imagine any other Holocaust survivor choosing a purposeful re-entry into a concentration camp after an earlier successful escape. The very idea is mind-numbing. But she chose wisely, for which her five children and six grandchildren are her testament. I will forever marvel at the immense resolve of this remarkable woman and her relentless insistence on survival.